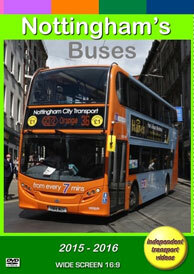 The city of Nottingham and county town of Nottinghamshire operate one of the largest former municipal fleet of buses in the United Kingdom. Still controlled by the council this large modern fleet has a vast amount of interest to the transport enthusiast. In 2004 trams returned to the streets of Nottingham and are currently operated by Nottingham Express Transit. These trams are in competition with the buses and are covered in greater detail in our ‘Nottingham Trams’ DVD programme. The modern day bus fleet is very colourful, as all routes are colour coded and branded. This branding was introduced in the early 2000s and given the names of ‘Network’ and ‘Go2’. The former have a green-based livery with colour coding for specific routes, the ‘Go2’ brand are silver based with route colour coding. Some buses are in an either generic green livery or silver livery, carrying a rainbow ‘swirl’ so they can be used on any route if the correct vehicle is not available. At the time of filming the ‘Network’ brand was slowly being phased out in favour of ‘Go2’. The fleet is currently made up of mostly Scania high capacity double deckers. These include Scania OmniDekkas with East Lancs bodywork and Scania N230UD double deckers with Enviro400 bodies. Single deckers are represented by the Scania OmniCity, OmniLink and OmniTown and ADL Enviro200 buses. There is a small number of Optare Solo and Solo SRs, with some being electric versions introduced in 2014. Other bus operators in the city are Trent-Barton, Yourbus based in Heanor and AOT Coaches that operate to the city from Hucknall. Trent-Barton also use striking colour coded liveries for their operations into the city on their single decker fleet. The independent transport videos cameras visited Nottingham on three occasions, the first in April 2015 and the second and third in August and September 2016. Many locations were chosen to give you the best view of this smart modern fleet. Some of these include Upper and Lower Parliament Street, which is probably the best location to see all operators going about their daily business. Market Street, Queen Street, Carrington Street, Collin Street, Victoria Street and Fletcher Gate are also featured. More action is filmed at Maid Marion Way and Beastmarket Hill. We then move away from the city centre to film the bus action on Southchurch Drive in Clifton. Our cameras also visit Beeston and Chilwell. 1966 saw the end of trolleybus operation in the city. To commemorate this event East Lancs bodied Scania OmniDekka, 696 (YN05 WFE) has been painted in the livery of the Nottingham City Transport trolleybuses, which we see in service on route 77 on Maid Marion Way operating to Cinderhill - back in the day this would have been trolleybus route 41! We hope you enjoy your visit to Nottingham with us!